Security Situation In Turkey On November 12 – November 19, 2018 (Infographics) 5.5555555555556 out of 5 based on 9 ratings. 9 user reviews. 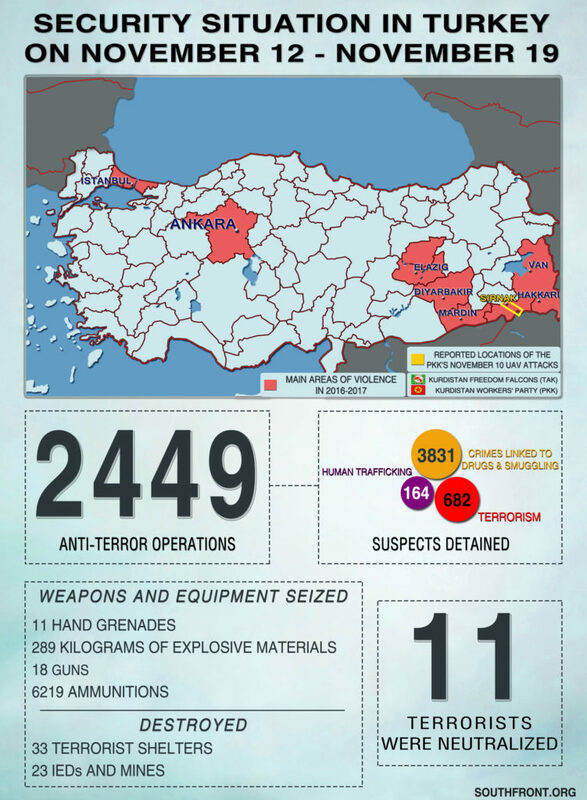 On November 19, the Turkish Interior Ministry released a new report providing a detailed look at the security situation in the country in the period from November 12 to November 19. According to the statement, the Turkish Army and security forces carried out 2,449 anti-terror operations across the country “neutralizing” 11 terrorists. The army and security forces also seized 11 hand grenades, 18 guns, 515 ammunitions, 289 kg of explosive materials and 6,219 rounds. Turkish forces destroyed 33 shelters belonging to terrorist cells as well as 23 IEDs and mines. It is a little step in the right direction. I wonder if they regret setting up and funding the vermin in the first place ?. What propaganda BS. The legitimate rights of a millions of people cannot be ignored. Whoever treats human beings as “vermin” is on the wrong side and definitely a lost soul. Do you want to find out which FSB and GRU Officers work for the CIA? CG is a path to that information. Who has refused to facilitate his defection? Who is stalling until he is dead? US doesn’t fear Snowden or Assange, it fears CG. You guys should be waterboarding people within you own organization, tonight! Starting with Timothy Bancroft-Hinchey.